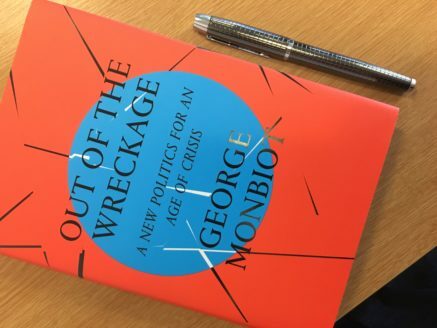 I can’t remember where I discovered George Monbiot but I have followed him on Twitter for a while now and it is evident that he is passionate about the environment. There seems to be a movement of journalists and economists (such as Kate Raworth who I have previously blogged about) who don’t yet seem aligned to any particular political party but who view the world we live in as a resource which needs cherishing and sustaining and a populace which requires a rethink of market and state. I had already read Monbiots book ‘How did we get into this mess’ which was an eclectic mix of essays on a broad range of both economic and environmental subjects but the book did not strike me as having a common solution. ‘Out of the wreckage’ however does provide us with some ideas which will move us to a fairer system but which the reader may find uncomfortable depending on how precious their particular vested interests may be. A term that crops up again and again is ‘the commons’ which effectively means a resource which a community has shared or equal rights such as land, fresh water, minerals, knowledge culture, scientific research or software. We may assume that the ocean is a commons as they are managed by no one but they are a free for all and therefore over fished! What a commons has, Monbiot argues, is a community which embeds people into the lives of others (rather than acting selfishly) and a shared purpose to sustain that resource for the benefit of all. Have we ever wondered how much multi national corporations strip the land which was once held in common to the greatest benefit of society, but now supplies those companies with much of their capacity for profit taking? Monbiot argues an injustice of ownership and gives many examples of this including Government funded scientific research which is then handed without payment to publishers but those same publishers then charge academic libraries vast fees for access, sometimes charging thousands of dollars per journal per year or will charge individuals $20-$50 just to read an article. In a commons this would be freely available to all. Whilst The commons appears to be an idealistic dream it is some of Monbiot’s specific ideas around such things as taxation which can make uncomfortable reading. A case in point (which affects me as a house owner) and this is not a new idea: Monbiot discusses the issue of land ownership and the extraction of rent which he calls ‘unearned income.’ As landowners we only compensate the previous owner rather than the people deprived of its value. More importantly, we play little part in the increased value of that land (perhaps through the building of a rail link or a new school?) but we enjoy all of that upside and if it is our principle primary residence, then we enjoy it tax free! Monbiot argues a ‘community land contribution’ which is a land tax to all intents and purposes although he argues that it is not a tax but a fee for services rendered : A return to the public of the benefits we have donated to landlords! How this could be implemented would be interesting and if the values fall, do you get a rebate! However, uncomfortable although this is to read, I can see that this is a fair argument and it seems to be gaining traction. I enjoyed this book immensely. I feel Monbiot is genuine and that comes through. One doesn’t have to agree with everything we read but this is one of those books which I felt got me thinking and that’s no bad thing!